Kollur is one of the famous revered Hindu Pilgrim centers in South India. It is situated in Guntur district of Karnataka State. Believed to be one of the seven pilgrim centers created by Parashurama, this small settlement, 106 km north of Mangalore on NH17, is of interest for the famous Mookamabika Temple. Everyday, this shrine draws thousands of tourists from all over India and overseas. Many young children start their academics through "Vidhyarambham’ rituals. Set amidst in a very picturesque surroundings, the temple is on the banks of the river Sauparnika at the foot of the hill Kudajadri. The temple is dedicated to Goddess Parvati in the form of 'Jyotirlinga' incorporating aspects of Shiva and Shakti. Goddess Parvati in Tamil is known as Thai Mookambika. The shrine is also known for its association with Aadi Sankara, a renowned religious leader. It is believed that, Adi Shankaracharya had a vision of Sri Mookambika Devi and he is said to have installed her image at this temple. He installed a Sri Chakram and consecrated the panchaloha (five metals) image of the goddess Mookambika on it. The small sanctuary is topped by a pyramidal tower with an arch shaped frontal projection surmounted by a square roof sheathed in glided copper. It stands in a small compound surrounded by subsidiary structures with arched openings, angles overhands and battlemented parapets. Yalis adorn columns either side of the entrance portico on the east. The temple dome, including the kalasha, is made up of gold. Inside the sanctum sanctorum of the temple, is the idol of the Goddess Mookambika in a seated posture, bearing the Sankha (conch) and the Chakra (discus) in her upper hands and holds her other two hands in the sign of abhaya mudra and varada mudra. And in front of this idol is the Jyotirlinga with a mysterious golden line running right across it. Near to this, are the images of Mahakali and Saraswati. There is a room near the sanctum which has Sankara Simhasanam (a stone peetam) and, it is here, Adi Shankara meditated and had a vision of Mookambika. There are also shrines to Veerabhadra, Subramanya, Naga, Vinayaka and Anjaneya. Veerabhadra is worshipped first by devotees before entering the shrine to Mookambika. Prayers can be offered to Lord Ganesha and also at the Shankara Simhasanam. Outside the central shrine are placed many shrines like Sri Veerabhadra Swamy, Lord Subramanya temple, Devi Saraswati Mandap (it is believed that Adi Shankara composed the famous hymn, the Soundarya-Lahari), Chowdeswari Temple and Shri Paartheswara Temple. In the outer passage, apart from several shrines, a golden chariot is on display. Note: Entry into the temples is restricted to Hindus and Men must remove their upper garment before entering the shrine. Cell Phones, Videography and photography are not allowed inside the main hall of the Temple . 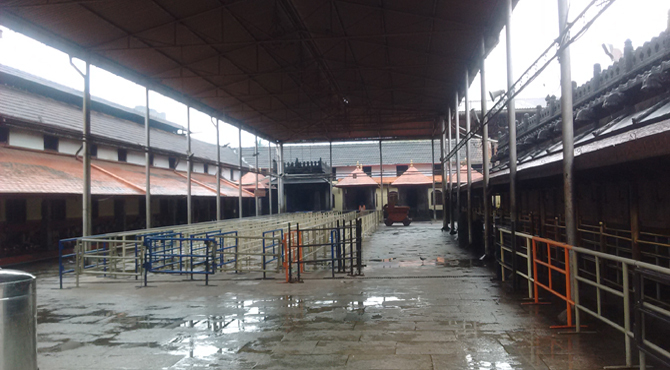 The Rathotsava (char­iot festival) in this temple is held in Apri-May . Festivals at Gurvayoor Temple include Vana­bhojana (forest-food) Habba (festi­val) and nine-day Navaratri festival. The Sauparnika river at this place is believed to have the power to cure diseases of those who bathe in it, because the river absorbs the elements of 64 different medicinal plants and roots as it flows. A visit to Mookambika is incomplete without climbing the 1400-meter high Kudajadri Hills. According to Puranas, it is here Devi Mookambika is said to have killed Mookasura. The moola sthana of Mookambika is on top of Kudajadri hills. Rugged wild terrain, only jeeps ply on this route. Buses can go up to Nagodi, about 22 km from Kollur. From here one have to trek through thick forests. Two shrines and Shankara Peedam (where Sri Adi Shankaracharya is said to have immersed himself into deep meditation) can be seen here.